Virginia’s Tidewater Region is steeped in military history. The world’s largest naval base is here in Norfolk. Historic Fort Monroe was the base of Union operations during the Civil War and was visited by Abraham Lincoln. Excellent military history museums abound here - and it’s not all static display. On this tour we will experience the best of the best and with lodging on the beach, you’ll be where the action is! Our exploration of Virginia's Military History begins at the Virginia War Museum, where American military history unfolds. Outstanding collections of personal artifacts, weapons, vehicles, uniforms, posters and much more trace the development of the United States military from 1775 through the present. See a section of the Berlin Wall and a portion of the outer wall from Dachau Concentration Camp. Galleries include Women at War and Marches toward Freedom, exploring the roles of women and African Americans in the military and Visions of War, the Museum's outstanding propaganda poster collection. Later we will continue on to Virginia Beach, where we'll check-in to our oceanfront accommodations. Dinner tonight is at Rockafeller's, a favorite restaurant of the locals, with a casual beach vibe. Here you will enjoy a classic Virginia Beach setting overlooking the picturesque Rudee Inlet which sits at the mouth of the Atlantic Ocean on Lake Rudee. A delicious three-course meal will be served, and a cash bar will be available. After breakfast at the hotel, we will be met by our tour guide and depart for Naval Station Norfolk, the largest naval installation in the world. On your riding tour, pass the historic homes built for the 1907 Jamestown Exposition on "Admiral's Row" and drive by the military vessels, including the magnificent battleships. An active-duty military personnel will board the motorcoach and narrate throughout the base. Then we will visit Nauticus, a nautical museum, where you will learn about the power of the sea, experience ship handling first hand and pet a shark. Visit the museum and then enjoy a self-guided tour of the Battleship Wisconsin - the largest battleship that served in WWII, the Korean War and the Persian Gulf War. Lunch will be on your own inside the museum's café. Next, tour the MacArthur Memorial for a glimpse into our country's history. Here you will view the outstanding collection housed in Norfolk's historic city hall which traces the life and achievements of five-star General Douglas MacArthur. You will also have the opportunity to view the short film which chronicles the General's life. The General and Mrs. MacArthur are entombed in the rotunda of the memorial. Nine separate galleries arranged in two levels circle the rotunda and tell the story of General MacArthur and the millions of American men and women who served in the United States Armed Forces from the Civil War through the Korean War. A gift shop with unique memorabilia is located on the premises. Next, enjoy ice cream on a famous waffle cone from Doumar's. Abe Doumar invented the waffle cone by taking a waffle and rolling it into a cone, to which he added ice cream. Doumar's still bakes cones on the original cone machines. Return to the hotel for free time to have dinner on your own and stroll the boardwalk. 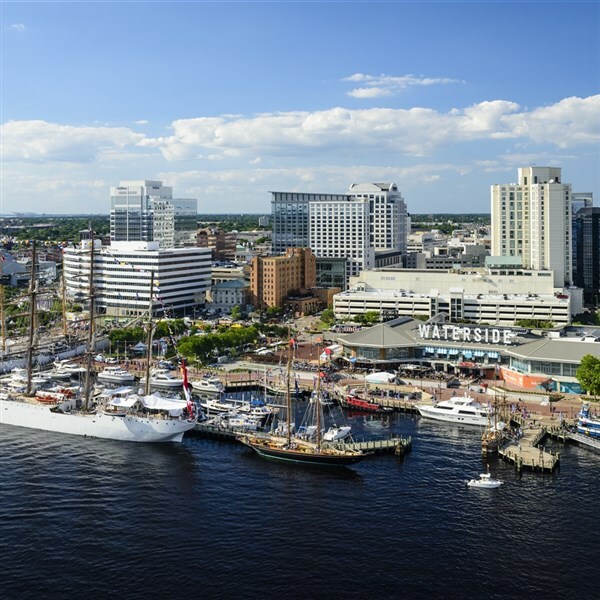 Following breakfast, join your tour guide and cruise the Victory Rover through the bustling Hampton Roads Harbor, one of the largest in the world. 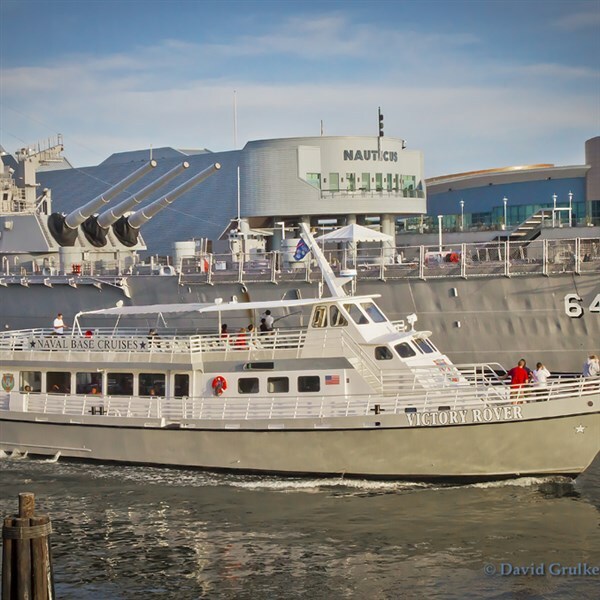 Enjoy fascinating and entertaining commentary during the two-hour excursion aboard this naval themed vessel. Take in the sights of aircraft carriers, nuclear submarines, guided cruisers and all of the other ships that form the world's most powerful armada. A boxed lunch will be served on board. Next, stop at the Virginia Beach Surf & Rescue Museum, a former life-saving station from 1903, which houses exhibits dedicated to preserving our maritime heritage. Life-saving service, ship wrecks and Coast Guard rescue work through World War II at the oceanfront are all displayed in the two floors of exhibits. The Lower Gallery tells the story of the life-saving service and in the Upper Gallery you will find tales of Virginia shipwrecks and the Battle of the Atlantic in World War II. We will stop at the hotel for a brief rest, then conclude the day at one of the most unique attractions in the region, the Military Aviation Museum, to experience Swingtime in the Skies. Located at the Virginia Beach Airport, this museum is home to one of the largest private collections of World War II and Korean War era fighters, bombers, trainers and seaplanes in the world. Many aircraft have been fully restored to their World War II condition and are used for flight demonstration, movie production and commercials. An in-depth guided tour will be given of the vintage aircraft and numerous other veteran vehicles housed in a variety of hangers and within the main museum. This will be followed by a special appearance by a historical interpreter - Rosie the Riveter or an authentic Mustang Fighter Pilot - who will entertain guests with exciting tales of life in the skies. A delicious BBQ buffet will be served for dinner. Following breakfast and check-out from the hotel, we will visit Fort Monroe and the Casemate Museum, home of the Army's Coast Artillery collection and the focal point of historic Fort Monroe which was built in 1819. Here we will learn about Fort Monroe's original mission to protect the entrance to the Hampton Roads Harbor by mounting an impressive complement of the most powerful artillery of the time: 32-pounder guns with a range of over one mile. The Casemate Museum depicts the history of Ft. Monroe and exhibits here include weapons, uniforms, models and drawings. A focal point of the museum is the casemated prison cell where Jefferson Davis, the President of the Confederacy, was imprisoned after the Civil War. We will then depart for home with fond memories of your time spent experiencing a taste of Virginia's military history. Arrival home is scheduled for later this evening.